When graduates of the Nigerian Institute of Journalism (NIJ) saw a publication on Facebook on their convocation, they could not hold back their pains. They decided to pour out their minds as comments to the image posted on Facebook. 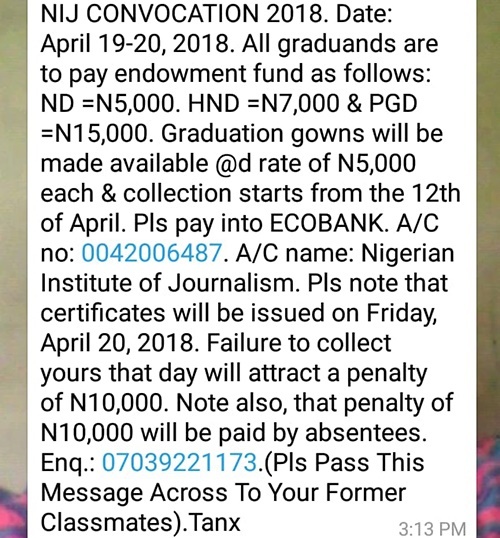 In the notice for the convocation posted by the management of the institution on its Facebook page read: "NIJ CONVOCATION 2018. Date: April 19-20, 2018. "All graduands are to pay endowment fund as follows: ND (National Diploma) =N5,000. HND (Higher National Diploma) =N7,000 & PGD (Post Graduate Diploma) =N15,000. "Graduation gowns will be made available at the rate of N5,00 each and collection starts from the 12th of April”. 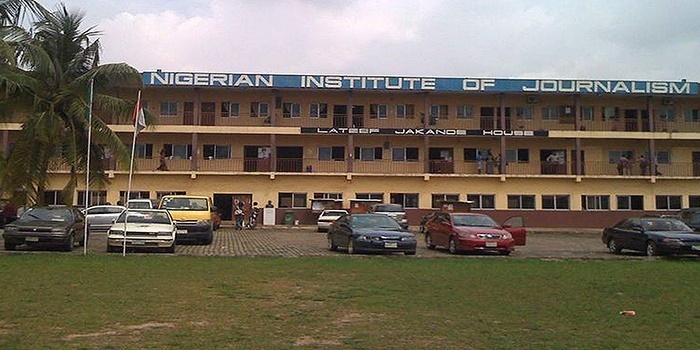 The institution in Ogba area of Lagos State further gave a bank account number that students should pay the fees into. There is also a penalty of 10,000 Naira for persons who would fail to collect their certificate on April 20, 2018. People who failed to attend the event would also pay a penalty fee of 10,000 Naira. Some of the graduates of the institution told Bounce News that the entire fees were exuberant and unfair. Another student also raised issues with a payment they had made for the National Insurance Scheme (NHIS) for students which he claims they did not enjoy. Bounce News visited the institution and the Registrar, Dotun Adenijo, said the institution was disappointed in the conduct of the students. "It is unfortunate that students will go on Facebook or other social media to be discussing the affairs of the school. "I have never heard it done… dragging the name of the institution in the mud. "One thing is that this is not the first place that students will be asked to pay endowment fee or for convocation gown. "There is a Students Affairs Officer that is supposed to handle such issues and the student did not see it as their first choice in addressing the issue,” the Register stated. “These students have forgotten that they took an oath on their matriculation day. “They swore that they will not do anything that will put the name of the institution to disrepute. “After that oath, look at what they have done,” he said. 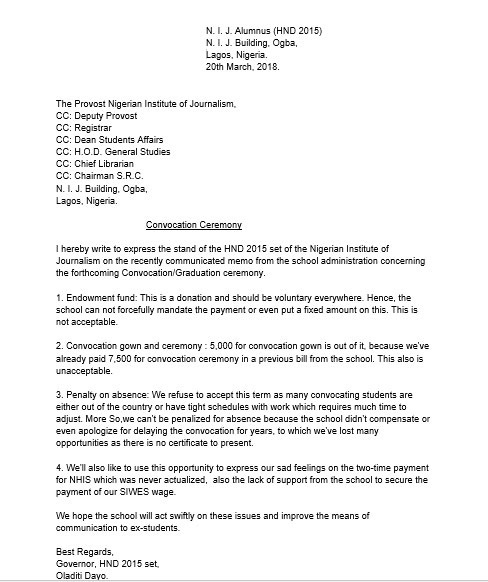 After the reactions trailed the notice on social media the aggrieved students wrote the institution, citing four issues – Endowment Fund, Convocation Gown, Penalty and NHIS. The students had raised concerns that some persons who may have travelled out of Nigeria could be punished for not coming for the convocation. But the Registrar explained that the penalty was not cast in stone and that the school had considered the chances that some students may have left Nigeria or may have genuine cause not to come. Anyone who may present that as an excuse will have to also show proof of cliams, Mr Adenijo said. He explained that the Endowment fund was for the students to sow back to the institution and that there had been no statement by the institution about forcing students to pay. On the penalty of not attending, the registrar said that all the institution wanted to ensure was that the students would participate. "Come to the convocation so that we do not pay for facilities and the students will not show up. "We want compliance and not money,” Mr Adenijo Stated. On the NHIS issue, he said it was rather unfortunate that students who graduated three years back could not enjoy the services they had paid for. “Students started enjoyment NHIS service for two years ago. But the students who left before that time had paid but did not enjoy the service. “It is unfortunate that it fell to their time,” he stated. Reacting to the student's concerns, the management of the institution cut the endowment fund to 6,500 naira for HND but the students insist that it is still too high.